At only £60 (when using the coupon code: (NSFMSP2014) to enable nursery schools across the UK to be ready for the new Statutory Framework we are offering you an opportunity to get a FREE movement resource (saving you £48.00) in this ‘Fundamental Movement Skills’ resource pack (see details below). 7 resources to develop fundamental movement & games skills in children, with an emphasis firmly on fun, movement and activity. 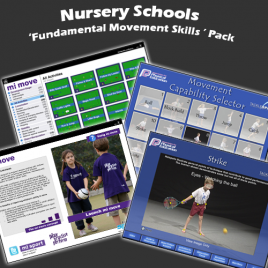 At only £75 (when using the coupon code: PSFMSGP2014) we are offering schools across the UK an opportunity to save over 68% off the full price of this ‘Fundamental Movement Skills and Games’ resource pack (see details below). Furthermore, you can utilise your Primary Premium Funding to take advantage of this offer now. (Note: this offer is limited to Windows operating systems only). 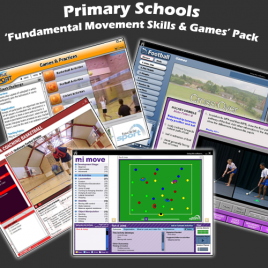 7 resources to develop fundamental movement & games skills and develop knowledge and understanding of fitness & health. 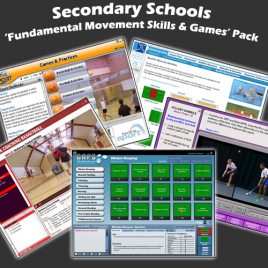 At only £75 (when you use the coupon code: quoting SSMGHFP2014) we are offering schools across the UK an opportunity to save over 74% off the full price of this ‘Movement, Games and Health & Fitness’ resource pack (see details below). Furthermore, you can utilise FREE the digital Performance Profiler to empower your pupils. (Note: this offer is limited to Windows operating systems only).